This Saturday (4/29/17) is our annual garage sale. 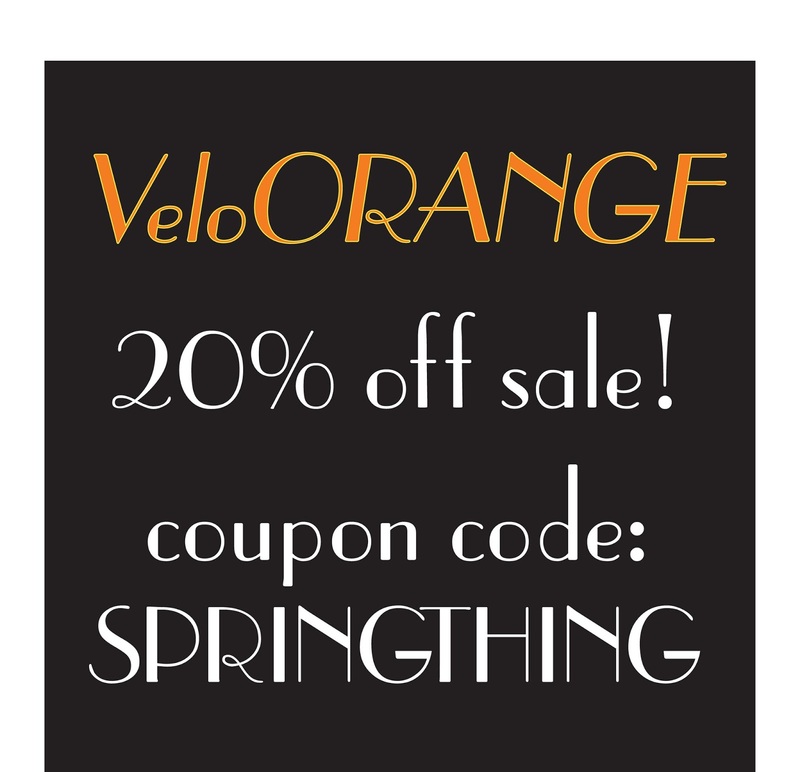 A chance to grab a deal on some sample parts, prototypes, dinged frames as well as get 20% off any new items in store. We'll open the doors at 9 am sharp on Saturday. We'll have donuts, coffee from Ceremony Coffee and tea from Adrian and Scott's collections for folks to munch and sip on while you browse. Update 4/30/17: Thanks so much to everyone who stopped by! It was a ton of fun. Update 5/1/17: The sale has concluded. Now we can't go and offer all our sample bits on line, but we would like to extend the 20% sale on new items to folks who can't get here. The online sale will run from 4/29 9am EST to 4/30 11:59pm EST. Enter the coupon code - SPRINGTHING - in the little "discount codes" box in the shopping card page, as in the screenshot below. Check out as you normally would and enjoy your savings! With the arrival of our latest container we received several new products. 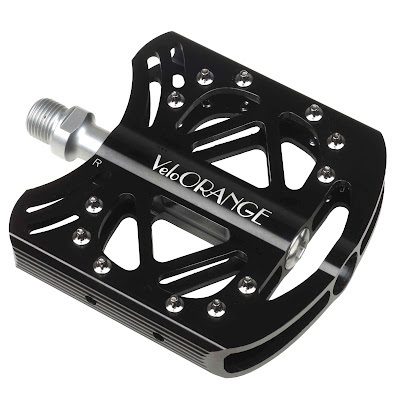 Silver, polished pedals may not go with every bike, so we're now offering our popular Sabot Pedals in the Noir colorway. 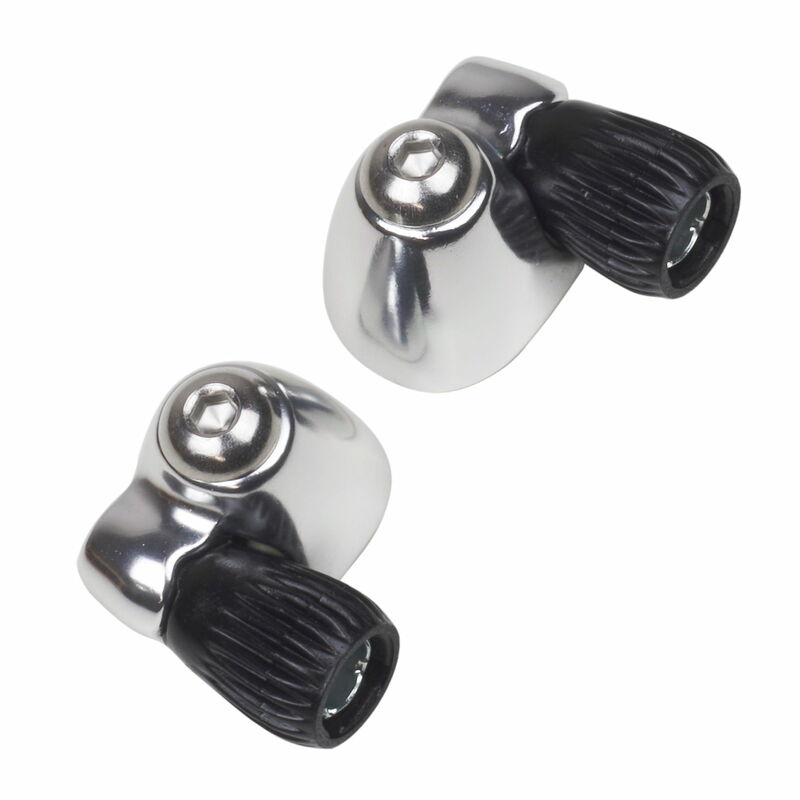 Details include a polished black anodized pedal body, silver rounded pins, and a silver spindle for contrast. 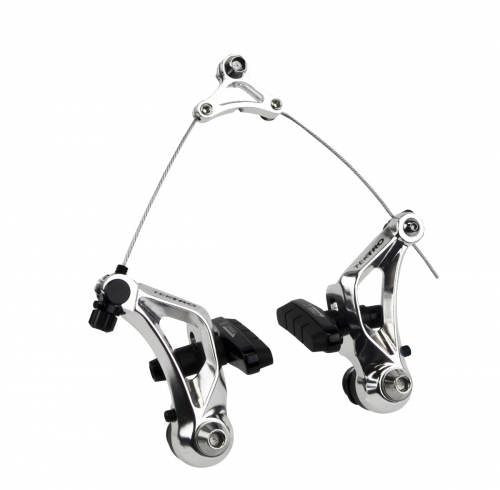 Three sealed, cartridge bearings make a super smooth spinning pedal with loads of real estate to support any shoe from bulky hiking boots to minimal sandals and everything in between. The rounded traction pins won't tear up your leather-soled dress shoes, either. Similarly to the aforementioned Sabots, a polished, silver headset may not go with every bike. Plus, black is faster, second only to red. It's science. Grand Cru headsets have oversized, sealed cartridge bearings and lightweight alloy construction. Split crown races make installation a breeze and maintenance is basically non-existent. Easy-peasy. Maybe you don't think that downtube cable stops are exciting, but these little guys from Dia-Compe are incredibly handsome. 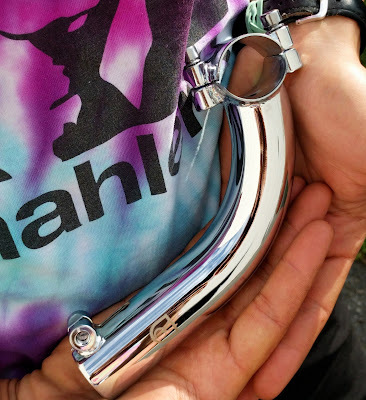 The ridges on the barrel make for easy micro-adjustment while in the saddle or in the workstand. Button head mounting screws are included. You'd be surprised how often we get asked for yellow housing, so we made it. Bam! Available in both Shift and Brake Kits. I love low-profile brakes for touring bikes. They don't interfere with luggage and have excellent stopping power. These 710's from Tektro are good quality brakes. They don't have the adjustability or high-quality brake pads that our Grand Cru Zestes have, but they do have an adjustor barrel and are a cinch to install. If you're in the area and are planning on going to our Garage Sale this weekend, be sure to sign up for the Facebook event page to stay updated! All right, now get out there and enjoy your day! 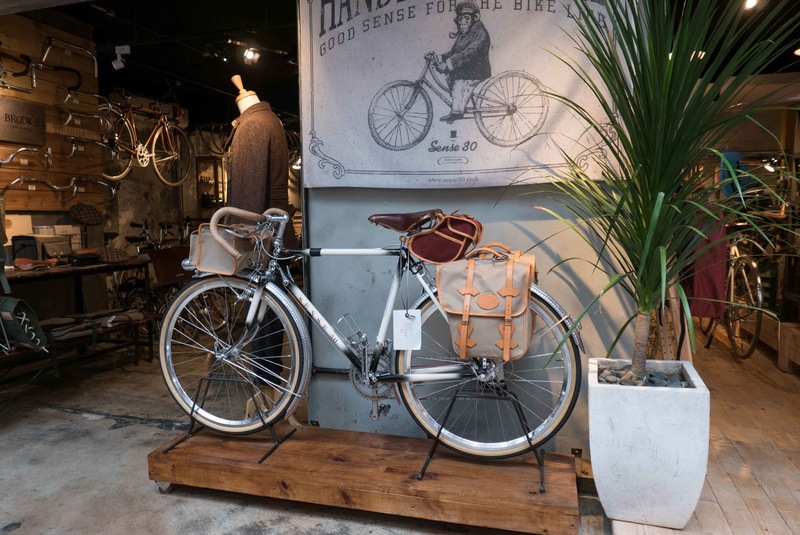 Our trip to Taiwan and the Taipei Bike Expo not only provided a look into new products being introduced for mainstream cycling culture (be on the lookout for the new Velo Orange full-suspension e-mtb) the trip also gave us an opportunity to visit our factory partners. We discussed new product ideas, production techniques, and the general climate of cycling. There were a lot of projects we wanted to discuss, two of which were frames and racks. Polyvalent is going through one more design and testing iteration before we are good to go to production. First, a new fork design is in the works. The current, bi-plane fork crown is ok, but its width makes the downtube attach further up the headtube making for less room in the main triangle. Prototypes should be here within the next couple months. We're also making the top tube a bit more slender in all the right places. Does a skinny top tube make a bike plane? I don't think so. To me, the concept of planing has more to do with a combination of several factors lining up rather than one or multiple bike frame properties. Food intake, wind direction, hydration, road quality, etc all play a role in your experience on your bike. Anyway, a properly dimensioned top tube minimizes luggage sway without compromising performance or weight. Adrian has hers built up as a flat bar Porteur. 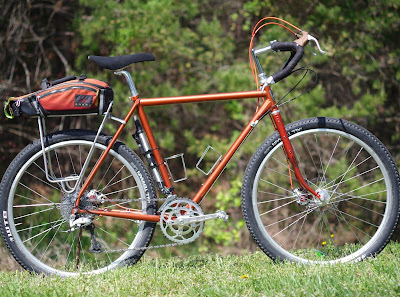 Bullmoose Bars, Pari-Motos 650bx42mm tires, and Shimano trigger shifters. 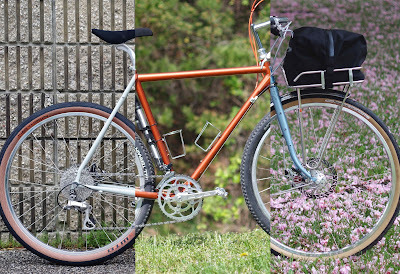 Clint/I have a stripped down Urban Day-Tripper with a mild riser bar, WTB Horizon 650bx47mm tires, and downtube shifters. Scott has his built up as an any-path-will-do setup. He went with 26" wheels rather than 650b for a bit more mud clearance and a lower bb for offroad stability. Dajia Far Bars, Shimano bar end shifters, and a special proto crankset to round up his build. We'll delve more into the individual bikes and builds in due time. They'll be at the garage sale next weekend for some one-on-one eye-ballin' and maybe even some test riding to get you into the mood. Since you guys and gals are riding rougher roads and bigger tires these days we decided to give our front racks a facelift. These new changes are designed to mitigate stresses from load and rough terrain, make installation a heck of a lot easier, and allow for a wider range of bike fitment. The decaleur (the upright portion which receives the bag mount) gets even more integrated into the platform of the rack. Stresses from stuffed handlebar bags and rough terrain are dispersed through the entire length of the tube and aft of the rack. Don't mind the wire nest. It has worked perfectly for many years. The included adjustable tang makes fine-tuning easier, too. 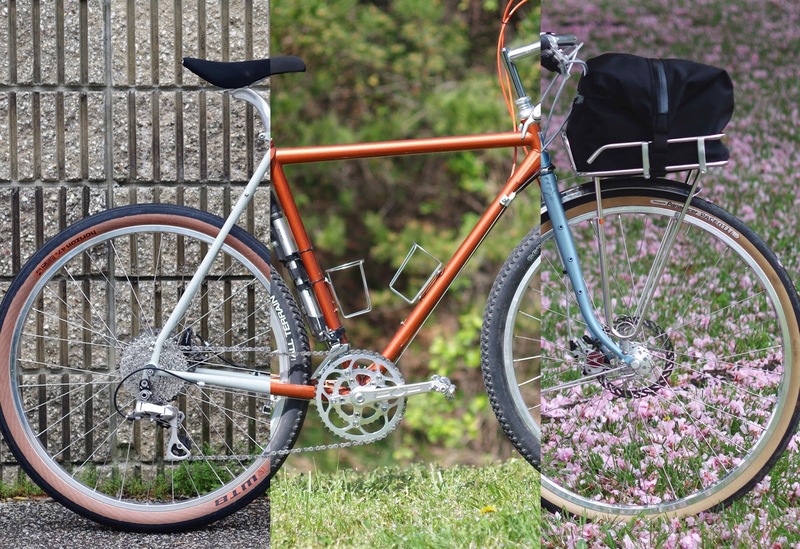 These changes will be applied to the Randonneur and the Pass Hunter racks. Similar changes will be made to the Campeur (improved platform) and Constructeur (adjustable tang). 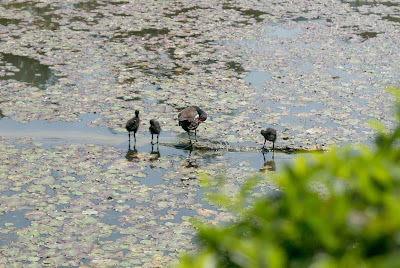 We're currently looking at early June availability. Quick note, the adaptors for 1" threaded headsets are on order and are expected to arrive early-June. When I started riding, one of the "rules" of cycling that was passed down from more experienced cyclists was never to have the chain in big and big or small and small. This meant you did not want the chain aligned with the largest cog in the back and the largest ring in the front or the smallest size cog in the back and the small ring in the front. This combination puts more strain on the chain. Chains run best when they are as straight as possible. It also puts more stress/wear on the chain rings and cassette. When using small and small with a compact double, the chain can strike/rub against the large ring due to the angle that the chain is at as well as the size difference between the small and large ring. So instead of being in big and big, you should be in a small and mid range cog. The big and big gear combination (46T x 28T) works out to a gear inch of 42.7 inches. If I use the inner ring and a middle cog (30T x 18T), I get a gear inch of 43.3 and a much straighter chain line. Now while chains have certainly become stronger over the years, some things have stayed the same. 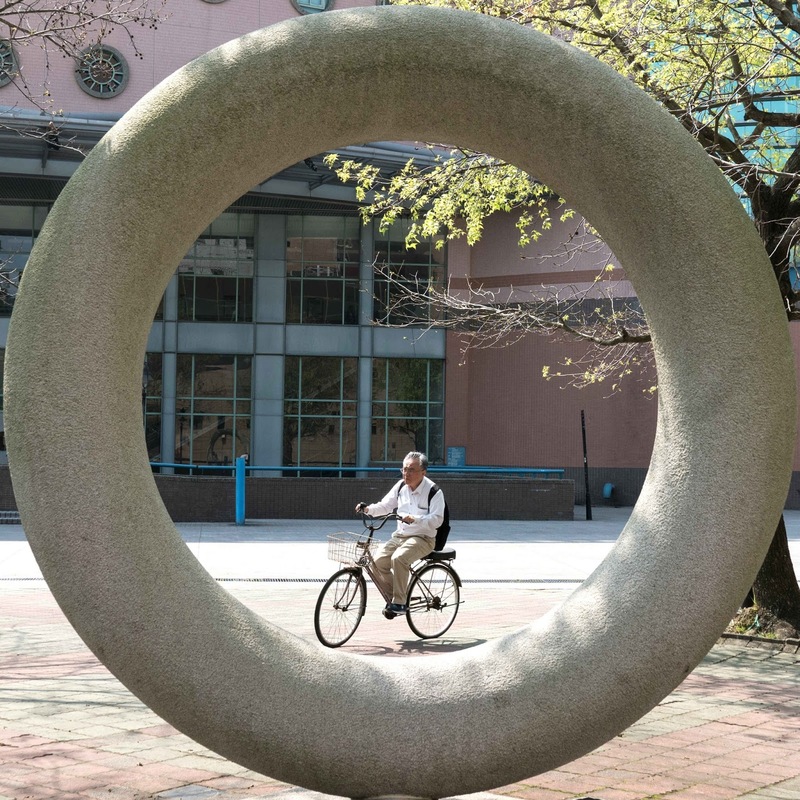 More folks seem to use the larger cogs while being in the big ring. This might be a reaction to the increasing popularity of 1 X systems. Just make sure your chain is long enough and most drive trains can handle it for a short period of time. Small and small is still something we don't recommend. The chain can get caught on the pins on the inside of the large chain ring (they are there to help shifting on 10 speed set ups, due to the narrowness of those chains). Typically the gear ratio that is the small and small is replicated by using the large ring and a middle cog in the back, similar to our earlier example of big and big. If you want to learn about gear inches/ratios the late Sheldon Brown's site has the best set up for figuring out the gear ratios on your bike. You can find it here. Owing that it is Good Friday, our resident baker Clint, took it upon himself to bake some hot cross buns. We'll be enjoying these today at the office with a coffee or tea. 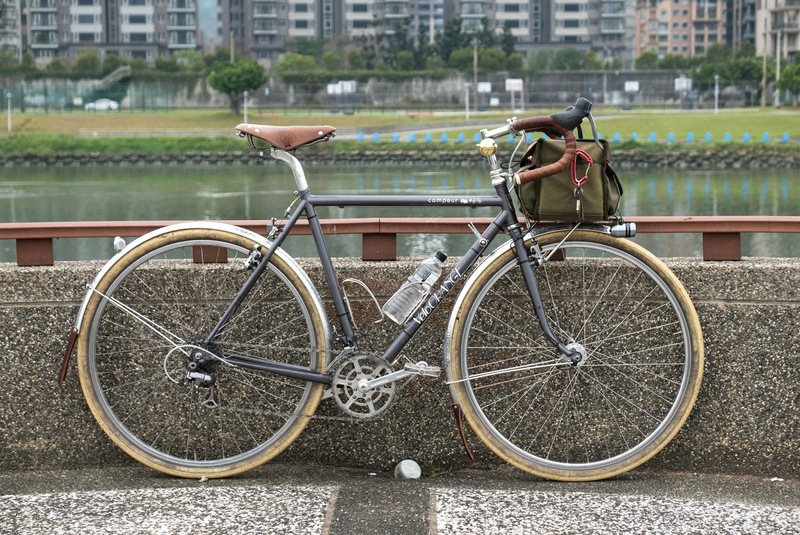 Road bikes converted to flat bars are gaining a lot of popularity in urban environments. The combination of an upright position and ease of control makes this type of build a great option for those riders who mainly ride in the city and want to be a bit more comfortable on group rides. This Pass Hunter Disc setup is our interpretation of an urban day-tripper to conquer any road condition that may crop up. We laced up some 650b wheels to be the basis of our build. By using the smaller wheelsize, we could increase the cushion of air the bike rides on. We selected the WTB 47mm Horizon tires, which end up being about the same circumference of a narrow-tired 700c wheel. Cobbles and potholes are vanquished, and hopping on and off curbs poses no threat. 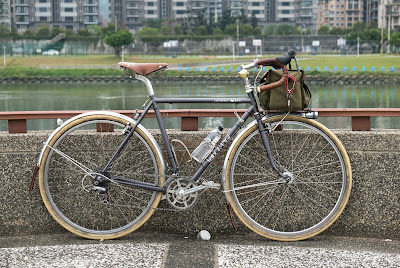 The Postino handlebar is a great bar for converting drop bar road bikes to flat bars or just as an all-around city bar. It's the goldilocks bar for city rides - not too wide, not too narrow. We opted to go with a wide range gearing because Annapolis and the surrounding area does have some hills. Our 50.4bcd 46/30t up front and 11-36t in the rear - enough to climb a tree. Clint scrounged up some super clean Campagnolo downtube shifters which we mated to our shifter mounts to make the dangler and pusher move around. The 7700-series Dura-Ace derailleur was never designed to work with a 36t cassette, so we used a Wolftooth Roadlink to extend the range of the cage. Shifting is fine, but not quite as fast as pairing the same derailleur with a 11-28t cassette. Then again, you're not shifting all that much around town, anyway. You may have seen this constructeur-style stem that we were thinking about re-making on a previous blog post. After a couple samples, it ended up being far too heavy and expensive. But it looks really cool. I'm thinking of making the "Bike Build Ideas" a more regular addition to our blog. We have several demo, sample, and show frames around that we look forward to building and re-building to give our readers some ideas for their own projects. A sign of spring's arrival is the sudden sprouting of mushrooms in a lot of places. 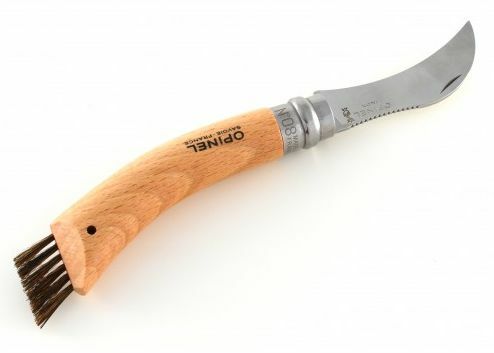 We've brought back the Opinel Mushroom knife for this special time of year. 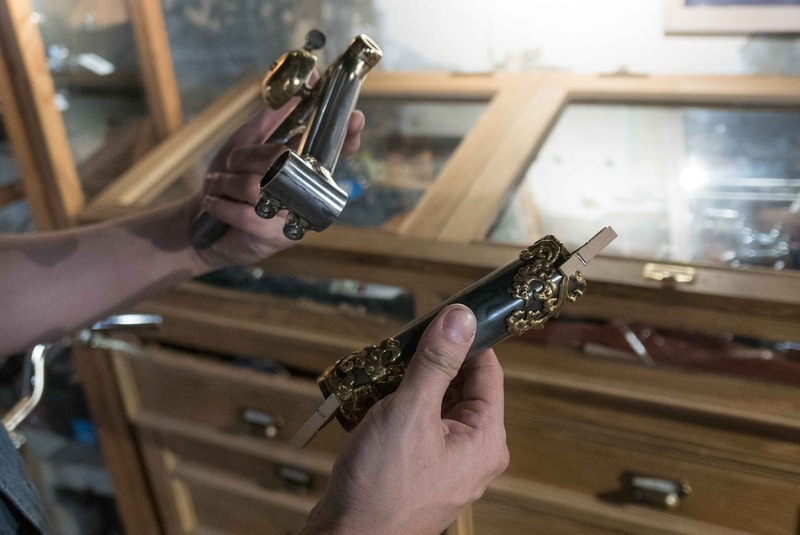 It has a curved blade to allow for careful removal of the fungus from its forest home and the boar brush on the end allows for careful cleaning of the mushroom without doing damage to its outer skin. Known as a couteau a champigon in France, we only keep these in stock for mushroom season, so once they are sold out, more won't arrive for a while. We also have expanded our range of Opinel knives to include a kitchen knife. It is a great all purpose knife with a Japanese style (Santoku) stainless steel blade. The design of the blade is such that there is less rocking required to slice something. This makes slicing veggies much easier IMHO. 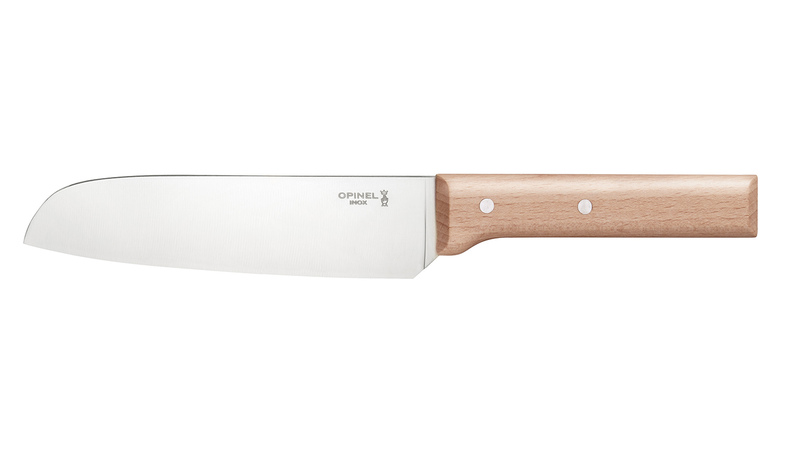 It uses the same wooden handle as the essential kit of knives makes it easy to grip and keep clean. It also has a continuous cutting edge that makes it easy to sharpen, and keeping a knife sharp is a real key to how well it performs. The Swift Camp Out is scheduled for this year again. June 24th is the date that we're all going to try and get out for the night via a bike. Whether you ride 10 miles from home to camp or 100, it's a great goal to work towards. Now's the time to start putting your touring kit together and doing some practice runs to make sure it all fits and doesn't sound like a tuk tuk going through Jakarta at rush hour. 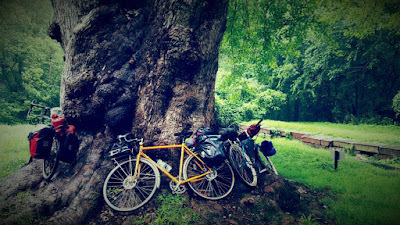 In addition to the Camp Out, what's everyone planning for their spring and summer bicycle tours? Again this year, we're going to have a garage sale to clean out samples, mismatched items, overstock products, and returns stacking up in our warehouse. The date we've picked is Saturday, April 29th. It will be from 9am to noon. 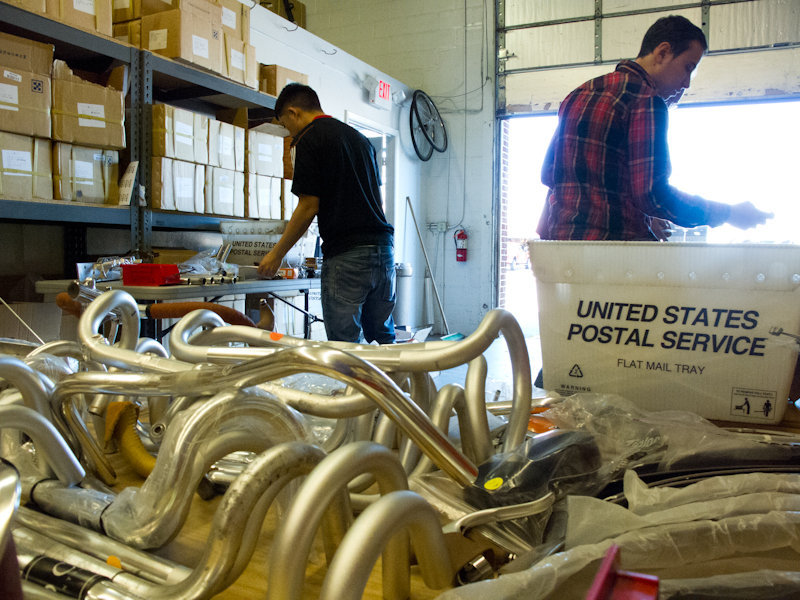 We'll have prototypes for sale, stuff that was put onto show/demo bikes, samples from our suppliers, and scratched parts. We'll probably even have a frame or two for sale. For those of you coming, you can also purchase any non garage sale items for 20% off retail (items on sale excluded). We'll have our usual supply of donuts and coffee on hand to fuel your shopping. The sale is at our showroom at 1981 Moreland Parkway, Building 3, Annapolis, MD 21401 (it's way down to the right as you come into the industrial park). Feel free to RSVP on Facebook so we know how many donuts to get! 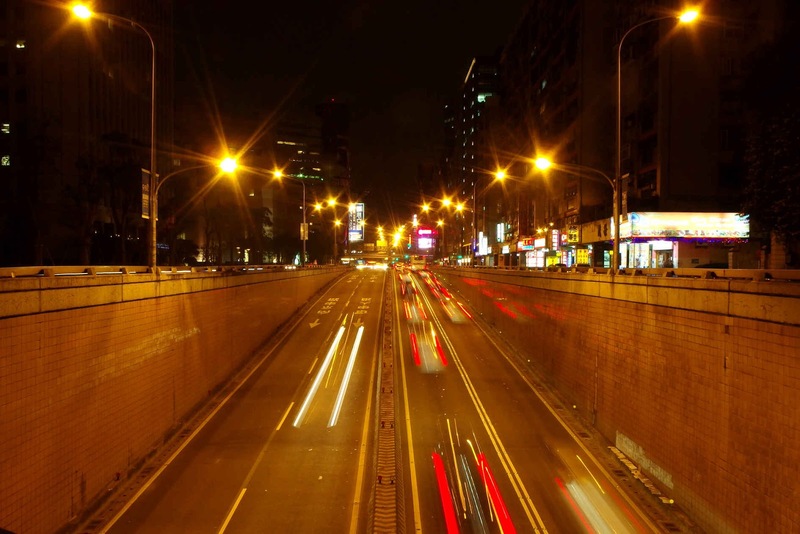 The riding through Taipei, Taiwan is like nowhere else I have ever experienced. Traffic goes by and around at speeds which should make you feel uncomfortable, but it is all a delicate choreography of swooping, merging, filtering, and acceleration that is acted out on the stage by bicycles, scooters, and cars. Amazingly, all of this happens with virtually no horn honking. The most important part is to fit in by being confident, and that means breaking some rules that are often considered commonplace. At a redlight, going around traffic to filter towards the front is perfectly normal. Quickly navigating around double-parked cars is expected and safe. Everyone on the road, regardless of what you're driving or riding, is treated equally and without prejudice. Nestled amongst all of the surface streets, there are a ton of parks and greenspaces as nice respites from daily traffic and the general hustle and bustle of city life in Taipei. 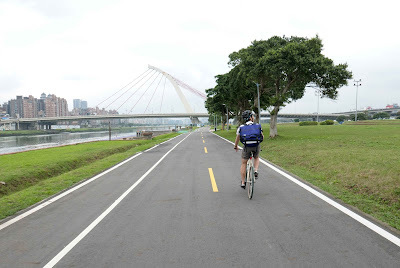 In addition, the riverside parks following the Tamsui and Keelung Rivers allow riders to traverse the outer edges of the city completely off the street. Though the route is flat, crosswinds and headwinds abound in these long, bike-centric highways. After a day at the show, we decided to get further out of the city and give our climbing legs a bit of a workout. Climbing through mountainous roads, we were awarded some breathtaking views and descents. I really enjoyed getting in the drops, snaking around corners, and overtaking those scooters that had left me in their dust in the valley below. Towards the end of the ride, we made it to one of my favorite shops, Sense 30. The guys here have made the shop a real destination for bike nerds coming from all over the world. In addition to custom, in-house framebuilding, they specialize in hard to find parts and accessories, built-to-order luggage, lifestyle apparel, and even have a museum of French, English, Italian, and American components. Also, locally roasted coffee to get you nice and jazzed. We'll be posting more info regarding show sightings, factory visits, and other product updates soon. Keep your eyes peeled. Here at Velo Orange International, we strive to offer the best balance between performance, functionality, and aesthetics. By borrowing designs from motorsports documentaries such as The Fast and The Furious (1-7), Redline, and Gone in 60 Seconds, we have developed a product which saves a whopping 0.314 seconds over 40km. As with any component upgrade, this just might solidify your place in Strava history. In addition to the existing rotating mass from a traditional wheel, there is rotational mass being supplemented by the integrated cap or "Spinner" which keeps spinning in the direction of the wheel's rotation. This forward momentum allows for increased carried momentum, optimal wattage transfer, and it even yields a higher interface success rate. Basically, due to conserved angular momentum, this revolutionary wheelset carries you up hills with reduced fatigue. The first production run will only be available for all-road bikes, but keep your eyes peeled for no-road and some-road compatibility in 2018. Product inspiration. They just keep spinning.